Thomas Alva Edison was born February 11, 1847 in Milan, Ohio, and died October 18, 1931, West Orange, New Jersey. He invented the phonograph, the incandescent electric light bulb, and the alkaline storage battery and the first motion picture camera. He laid the foundation for a world record 1,093 patents and created the world’s first industrial research laboratory in Menlo Park, New Jersey (not California). At an early age he developed hearing problems, which have been attributed to a familial tendency to mastoiditis. 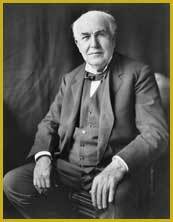 Whatever the cause, Edison’s deafness strongly influenced his behavior and career, providing the motivation for many of his inventions. His interest in motion pictures began before 1888, but the visit of Eadweard Muybridge (a San Francisco photographer, who conducted motion-sequence photographic experiments) to Edison’s laboratory in West Orange certainly stimulated Edison’s resolve to invent a camera for motion pictures. Muybridge proposed that they collaborate and combine the Zoopraxiscope with the Edison phonograph. Although apparently intrigued, Edison decided not to participate, realizing that the Zoopraxiscope was not a very practical or efficient way of recording motion. In an attempt to protect his future, he filed a caveat with the Patents Office on October 17, 1888, describing his ideas for a device that would "do for the eye what the phonograph does for the ear" -– record and reproduce objects in motion. He called it a Kinetoscope using the Greek words "kineto" meaning "movement" and "scopos" meaning "to watch." One of Edison's first motion pictures and the first motion picture ever copyrighted showed his employee Fred Ott pretending to sneeze. In 1893, Eastman Kodak began supplying motion picture film stock, making it possible for Edison to step up the production of new motion pictures. He built a motion picture production studio in New Jersey that had a roof that could be opened to let in daylight, and the entire building was constructed so that it could be moved to stay in line with the sun. C. Francis Jenkins and Thomas Armat invented a film projector called the Vitascope and asked Edison to supply the films and manufacture the projector under his name. Eventually, the Edison Company developed its own projector, known as the Projectoscope, and stopped marketing the Vitascope. The first motion pictures shown in a "movie theater" were presented to audiences on April 23, 1896, in New York City.